One thing that annoys me is seeing people comment this on longboard videos – “Just one pebble ….”. WELL, let me tell you some facts bucko. Longboard wheels EAT pebbles for breakfast. Today’s article will be a simple guide explaining what longboard wheels are and what each of their features are for. It will not be a super exhaustive guide, but it will give you a good foundation of understanding. 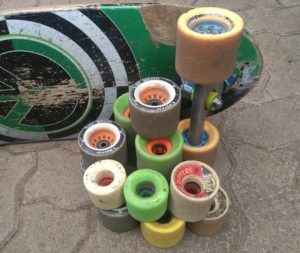 What’s the main difference between longboard and skateboard wheels? How do they typically compare in size, use, and hardness? What goes into a great longboard wheel? What is wheel durometer and how does it affect the ride? So what good are harder or softer wheels? How hard should freeride wheels be? How hard should dancing wheels be? How hard should downhill wheels be? Which wheel works best for your needs? Skateboard wheels are typically designed for parks and the street. Whilst longboard wheels are mostly geared towards traveling distances, going as fast as possible, sliding as easy as possible, or not sliding easily at all. They have a lot more uses and there really is a broad spectrum of them out there. The average skateboard wheel is typically 50-59mm in size. They are designed to be used on smooth pavement (like those you’ll find in parks) and they are around 99a in hardness. 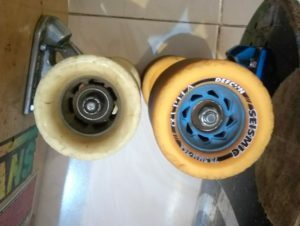 Longboard wheels in comparison range from 60mm to 80mm in height. The taller height makes them more suitable for going over asphalt, over pebbles and providing a more comfortable ride over uneven surfaces. 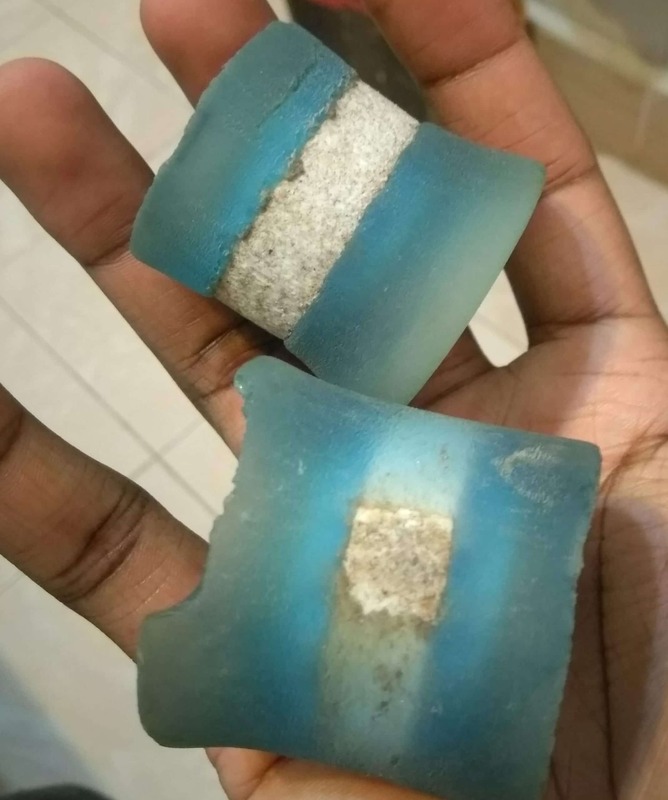 Their hardness typically ranges from 74a to 86a, with the softer ones being better for skating on rougher, bumpier roads. 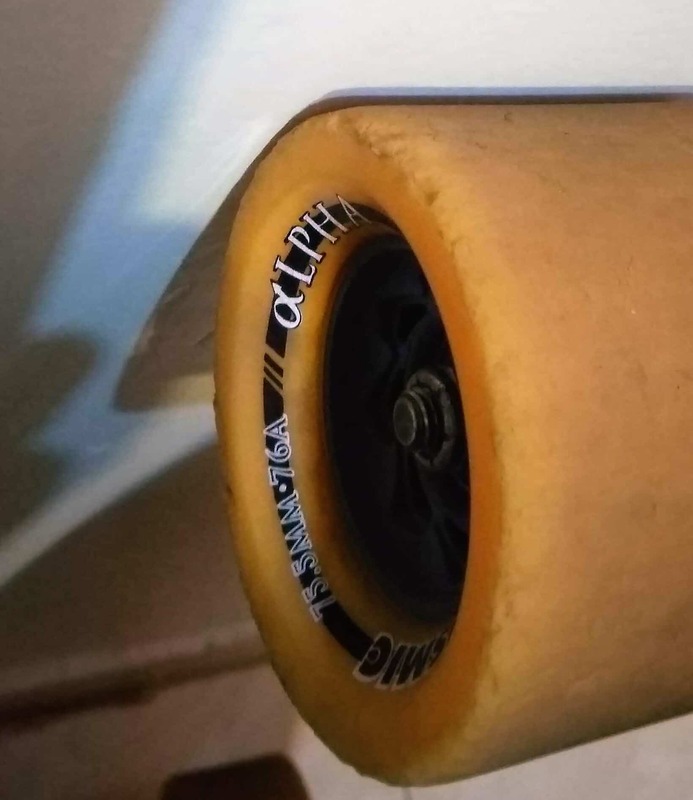 Finally, skateboard wheels usually come with a rounded lip shape. 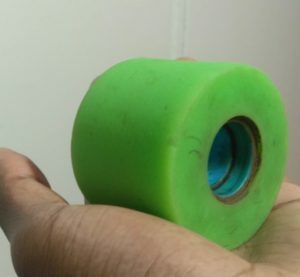 Longboard wheels vary with their desired purpose, so their lip shapes usually vary. First things first, if you’re looking for a decent cruising wheel, most longboard wheels would do. The most important thing for a cruising wheel is simply the durometer and the size. Something in 70mm and 80a will do you well. Whilst the lip shape and core shape doesn’t really matter so much. The urethane is basically the “rubber” the wheel is made from. Harder wheels basically roll/accelerate the fastest. This is good if you have to go really fast over a short distance and have a smooth surface to skate on. However, hard wheels will transfer every “shock” you get from going over a pebble, a crack or coming off a curb. Because of this, they aren’t very comfortable to skate on roads because they don’t absorb much road vibration. Finally, the harder the wheel, the easier it will slide. However, it will be hard to control in a long slide and they won’t grip around corners very well. Softer wheels are slower but are more comfortable to skate. They provide a smooth ride over most surfaces and grip well when going around corners. The softness allows them to absorb a lot of road vibration. Finally, they are also harder to slide but slide smoother and less violently when they do. Because they are softer, these wheels tend to mush against the road and don’t roll as fast as harder wheels do. 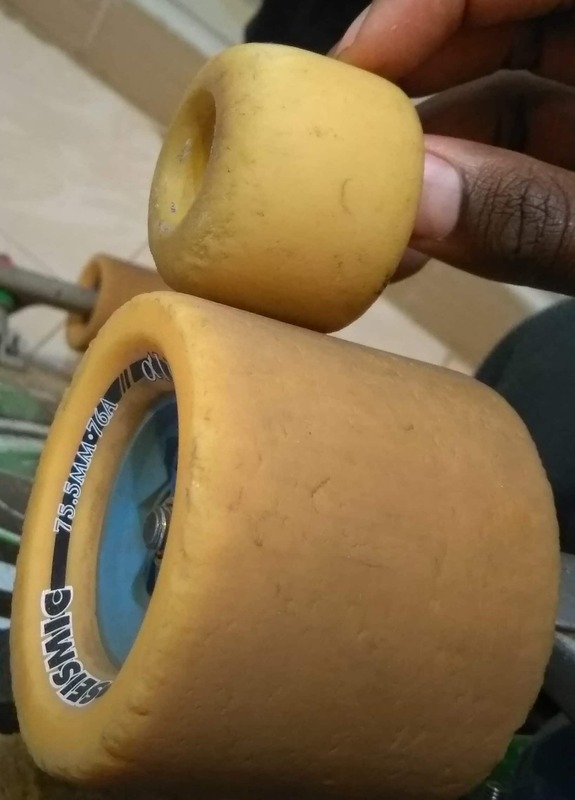 ****So, some of you may now be wondering, if soft wheels are slow, why do longboarders use them to skate fast? This is because of the use of wheel cores and urethane with different rebound properties. In short, a high rebound urethane can be in soft durometer but still feel stiff and roll fast, whilst a low rebound urethane can be in a harder durometer but feel soft and slow. When it comes to wheel cores, they stiffen up the wheels and make them feel harder than they really are. They can really improve how they work. We’ll get into this a bit more below. In summary, the hardness is the most important feature to determine how comfortable a wheel will feel, how fast it will roll and how much it will grip the road. Freeride wheels tend to be all over the spectrum, however, wheels between 78a-83a work well for freeride. Some companies have softer wheels with great urethane that slides well and other companies have harder wheels that slide and last long too. For beginners, the harder wheels would be easier to slide and learn on. But it’s not easy to go wrong with a wheel between 78a-83a in hardness. Between 78a-83a too. Wheels in this spectrum will not be too soft or too hard. They will roll decently and be comfortable to skate. For example, a wheel like the Seismic Encores are good examples of longboard dance wheels. They have a large core so will be light for quick acceleration and when you do flip tricks with your board. Between 74a-80a. However, you will encounter wheels on the edge of the spectrum at 83a and 73a. If your wheel of choice has a large core, 74a-78a will be ok. If not, then go for a wheel between 78a-80a. I suggest this hardness because they will provide a smooth slide with good braking power. For beginners, look to the slightly harder formulas for easier sliding. A good example of a beginner downhill wheel is the Kevin Reimer P0well wheel in 75a. They are easy to slide and feature a high rebound urethane for great roll speed. 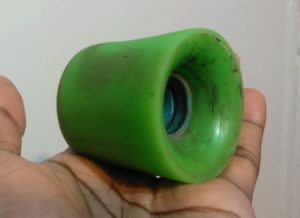 Typically, skate wheels have rounded lips. This makes them slide easier, especially for doing bluntslides, power slides and for grinding against coping. These lips are to help a wheel provide maximum grip. They help the wheel maintain traction round corners and prevent it from sliding – the lips are perpendicular to the floor and resist sliding by pushing against it. These wheels are what downhill racers use for racing so they can have the maximum grip in the corners. These wheels allow a wheel to transition from gripping to sliding as smoothly as possible. There are varying degree’s of wheel lip roundness, but typically, the rounder they are the easier they slide. However, as these wear down the rounded lip can change shape. And this will affect how they perform. Basically a mix of the two. The edge of the wheel is cut at a 45* angle to the ground. These won’t break traction as easily as wheels with the rounded lips, but they won’t be as grippy as the square lips. These wheels will be the most consistent and keep the lips the same angle as you wear them down. The edge will remain the same until you get to the bottom of the bevel. You’ll often find wheels that have a mixture of the above. One side might be rounded and the other square, or one side rounded and the other beveled. different shapes and sizes, and they can go a long way to dictate how a wheel performs, how it wears, how fast it rolls etc. They can basically be split into two categories and you can choose from either big or small cores. Big cores basically serve to stiffen up the wheel. 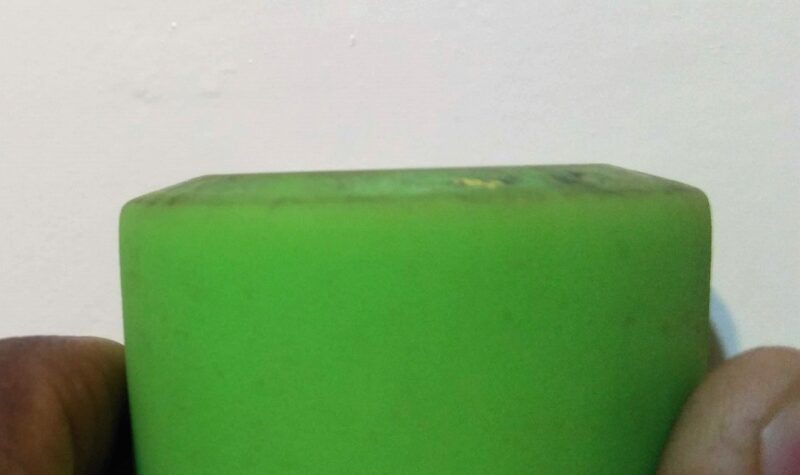 By having a rigid center as the core, the urethane around that center naturally becomes flexes less and acts stiffer. This is important because when a wheel doesn’t flex it has better overall contact with the ground. This means it will slide better, roll better, grip better and have more consistent wear down to the core. It also serves to lighten up the wheel and stiffen the urethane to achieve faster acceleration and higher top speeds. So yeah, when a large core is paired with dense urethane, it makes for a dangerously beautiful combination. So with thanks to large cores, wheel companies can turn 74a wheels that would normally roll sluggishly on small cores, into fast rolling downhill machines thanks to the use of big cores. As you will observe, any competitive downhill wheel has a big core. And this is the same with some of the best and most consistent freeride wheels too. Finally, because of how light they make wheels, some of the best dancing wheels have big cores too. Personally, I like my freeride and downhill wheels with big cores because I’m all about that roll speed. There is nothing that annoys me more than going down a hill slowly because of a slow wheel. It just robs me of the pleasure of going fast. Check out the image on the right to see some downhill wheels with large cores. These don’t perform as well as the ones above but they have their purpose. Unlike big cores, small cores are cheap to manufacture and these wheels are cheaper in general to those with big cores. These wheels have more urethane and absorb more road vibration. They are in general more comfortable to skate than wheels with big cores. Wheels with big cores often feel stiff and often reflect back road vibration. So yeah, wheels with small cores these are great for skating slightly rougher roads. Wheels with small cores tend to be smaller at around 70mm in size. Any larger and they tend to feel sluggish and really heavy because of all the urethane. That said, not everyone wants to pay extra for a wheel with a big core. Wheels with small cores work decently and you will find them widely used by everyone. However, if you are looking for maximum performance, big core wheels are the way to go. I personally really like my cruiser wheels with a small core for maximum comfortability and excellent vibration absorption. So we’ve covered cores, right? What’s next is how the cores are placed inside the wheel. ** The above said, none of this is critical if you are simply using your wheels for cruising. It may not matter too much for dancing either. Basically, the core is set dead center in the wheel. This shape allows for the most even wear as you wear down the wheel. However, it doesn’t provide the best performance when it comes to griping or best sliding. I personally like center set wheels. They feel perfect on my longboard and initiate sliding exactly when I want them to. They feel better to me to slide than side set or offset wheels. They also provide a distinct feeling between grip and slip which I really enjoy. This core will produce the smoothest sliding wheel and will provide the smoothest grip to slip transition. Personally, I find these have a weird slide initiation. They require you to get to the edge of traction before they start slipping. I like a more abrupt grip to slip transition. That said, a lot of people enjoy sideset wheels quite a bit. It is very much personal preference. Basically a happy middle between sideset and centerset. The offset core placement is the best of both worlds. Wheel companies usually experiment to find the best offset placement, whether it’s 1mm closer to the center or to the side etc. Apparently, the grippiest wheels are offset as the best balance can be found with this core placement. Basically the opposite of sideset with the wheel core being placed closer to the truck nut on the axle. This design gives a wheel the harshest transition between grip and slip. You are either gripping or slipping with no mellow in between. I don’t recommend them to beginners because they are rather difficult and fickle to slide. Finally, you can flip your sideset or offset wheel to get inset ones. This allows you to experiment and see what different core placements feel like. Apart from how they allow a wheel to wear down, I think core placement is not that important for advanced riders. You’re still gonna slide or grip whether you have a side set, inset or offset core. As long as your wheel fully fits under your board, you should be able to grip and slide effectively. Most importantly, it’s about getting used to a wheel that is key. It matters depending on what you want to use the wheel for. The taller a wheel, the higher top speed it will have but the harder it will be to get it moving (slow acceleration). It will also have lots of momentum at that size and roll smoother over cracks, pebbles, and small rocks. If you go with a tall wheel, you will probably need risers to avoid wheelbite on your cruiser board or downhill skateboard. In contrast, the smaller a wheel, the easier it will accelerate and the lighter it will be. However, it will not have a high top speed and it will be more prone to getting caught in cracks and stopping in pebbles. For an extreme example, consider longboard and skateboard wheels. Personally, when it comes to stand up slides I like wheels that are 70-75mm. This is because they have the longest life and will maintain a decent roll speed until they wear down to a size of 63mm. That said, a lot of people enjoy a wheel that is between 66-72mm in height for freeriding. Roll speed and going fast isn’t of too much importance for most when they are trying to do spins and big slides. You definitely want a wheel that is less than 70mm. This is because you will mostly be pushing short distances and you’ll be needing max acceleration. Smaller wheels are also usually lighter. You want something light so you can pull of tricks a lot easier. Wheels between 60-68mm are usually perfect. Typically, to advanced riders I recommend 75mm wheels. These are harder to get moving, but they allow you to go really fast and have a high top speed. These wheels will also give you the best performance over roads, whether they have wavey pavement or a slightly rough surface. For beginners, I recommend downhill wheels around 70mm in size. They aren’t so difficult to push and aren’t so heavy you can’t push them out in a slide. Personally like 70-75mm wheel because of how fast they can go and how smooth they ride. Last but not least, lets talk about thane. Urethane determines how the wheel will slide or how much it will grip, it also determines how much road vibration it absorbs and how fast it rolls. Soft wheels absorb vibration nicely but are slow and wear fast. Vice versa when it comes to hard wheels. Some formulas leave a lot of thane on the ground when you slide, some don’t. Others allow a wheel to last forever and others make a wheel wear out in just a day. Some roll really fast and others feel sluggish and slow. There are loads of different urethanes and usually, the wheel company tells you what to expect from their urethane. You should also check out wheel reviews to find out more about a wheel; like how it slides, how durable it is and how fast it is before buying it. Urethane comes in degrees of hardness with soft wheels good for this and hard wheels good for that. Typically, soft wheels are 74-78a. Harder wheels are 80-86a. Between that spectrum, you have a variety of freeride, downhill, dancing, cruising etc. It can be a bit confusing so I’ll give you a very general guide below. Finally, it’s important to buy quality products, especially when it comes to wheels. A cheap wheel will just slide bad and won’t perform well at all, giving you a less than satisfactory skate experience. You want a lightweight wheel for fast acceleration when pushing, and to make sure the overall weight of your board remains light. You don’t want a heavy board because it won’t make it easy to do tiger claws, flip tricks etc. Wheels 60mm-66mm in size, that have a narrow contact patch and radiused lips for less sideways resistance are perfect. Durometer be should between 78a-83a. Click here to check out my wheel suggestion for beginner longboard dancers on Amazon.com. For freeriding, you want a wheel with slidey and durable urethane. Especially if you are a beginner. You want the wheel to have a rounded lip or bevel shape, so it can break traction easily. You also want the urethane formula to be icey (also know as slidey). I recommend durable, icey freeride wheels because beginners tend to flatspot their first wheels. I certainly did so and a lot of my friends had the same experience. A wheel with wear resistant urethane will not flatspot easily and will last a while. Click here to check out my wheel suggestion on Amazon.com. I would suggest a sharp lipped wheel in 80a durometer. Like an Orangatang 4 prez. A wheel in this durometer and shape will hold an edge and grip a corner, but won’t fight you too much when you try to slide it. This will allow you to learn the basics of taking a corner, sliding for the apex, scrubbing and figuring out how to perfect your slide initiation. Click here to check out my suggestion for you on Amazon.com. Learning about and finding the perfect wheel for your needs can be a bit of a headache. That said,the experience is the best teacher. Bite the bullet and invest in a set if you want to gain skills and learn first hand what each property of the wheel does.